While it won't be the first time the WWE star-turned-Hollywood actor Dwayne Johnson has graced Saturday Night Live with his presence, it is sure to be one of the biggest. The man formerly known as The Rock will be hosting the late night sketch comedy show on March 28, just ahead of the debut of his latest film Furious 7, which hits theaters April 3. His musical guest will be singer-songwriter George Ezra. While this will mark Ezra's first-ever appearance, Johnson is certainly no SNL rookie. The former wrestler has already hosted the NBC live comedy show a whopping three times, which in some cultures may even constitute honorary cast member status. This will be the Hercules star's first time hosting since 2009 and only his second appearance since he officially transformed from his wrestling alter-ego to the man we now call Dwayne Johnson. Some of you may remember his 2009 opening monologue, where he performed a doozy of a song and dance number among other Saturday Night Live greats like Kristen Wiig and Fred Armisen. If you haven't seen it, definitely check it out below. What can we expect to see from Johnson in the upcoming episode? 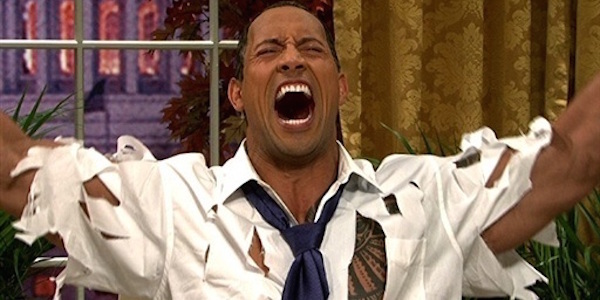 Well, in looking to his past performances on SNL, we can almost certainly count on his reprising his recurring politically-charged character The Rock Obama. For those of you unfamiliar, the character is a Hulk-like version of Barack Obama that arrives when the President gets angry... ultimately transforming him into an insane beast-like man called The Rock Obama. The last time he played the role, however, Armisen was onboard as Obama. This time would mark the first transformation from Jay Pharoah's Obama, which if they choose to revive the skit, should bring a new level of funny to the table. Johnson not only has Furious 7 on the docket, the actor is also the star of the upcoming action thriller San Andreas, hitting theaters May 29, 2015. That said, there's a good chance we may see not only a rendition of sorts revolved around the Fast & Furious installment (maybe a cameo from Jason Statham and/or Vin Diesel), but also something based on earthquakes or natural disasters, as is the basis for the plot of the latter film. SNL's March 7 episode, featuring Chris Hemsworth reprising Thor in an funny skit called “Avengers News Report” and playing the role of Chip in an Empire parody, reportedly delivered pretty strong ratings. SNL will certainly be hoping to build upon that with next weeks episode featuring Johnson as host.